MISSOULA — Cami Sellers has pretty much spanned the country in two seasons of college softball. Her story started in SoCal, where she was so good in high school that Boston College came knocking. She wasn't crazy about playing for Doug Flutie's alma mater, so she went looking for a place to transfer. There's a lot of good college softball between Beantown and Zootown, but Sellers managed to land on the Montana Grizzlies. Credit former high school classmate and ex-Grizzly Madison Saacke with turning her on to the Treasure State, then credit Griz Nation for doing the rest. 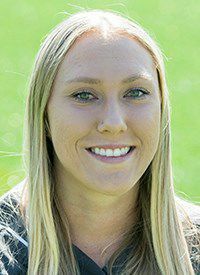 "I came to visit here and I was like, 'Oh my gosh, I love it,'" said Sellers, who collected two hits Sunday, bumping her team-best batting average up to .341 in a 7-4 home win over Portland State. "It was just everything — the support from everyone, I love the coaches and I like the smaller town. Everyone knows each other and everyone has each others' backs. I've never met nicer people than Missoula, Montana." Sellers, whose team jumped back in the Big Sky Conference race with its weekend sweep of the Vikings, feels the love from the fans at Grizzly Softball Field. Evidently she's not the only one, because Montana is 9-3 at home this season. "You look in the stands and everyone is cheering for everyone," Sellers said. "We had fans at Boston College. But the family aspect, here everyone is a family and we're all together. There it was not as tight-knit." Sellers is more than just a consistent hitter. The sophomore smacked a Paul Bunyan-esque home run into the parking lot beyond center field Saturday, prompting a reporter to ask if the ball rolled to the convenience store on the corner. "Yeah, it's still sailing, still going that way," joked the first baseman. "Coming off my bat, I didn't even think it was going out. Then it was like, shoot, that went pretty far." Just like the second game of Saturday's doubleheader, the Grizzlies (4-5 conference, 14-26 overall), spotted the Vikings (2-6, 13-24) a lead Sunday. Montana starting pitcher Michaela Hood surrendered three runs on four hits before she was replaced by Colleen Driscoll in the third frame. Driscoll (7-8) was rock-solid, allowing just one run the rest of the way. And Montana's offense heated up in the bottom of the third, chasing PSU starting pitcher Serafine Parrish (1-7) with a four-run surge. "It's always hard to get Game 3," Montana coach Mel Meuchel said. "It's a scrap. Portland State answered right away today and we found a way to answer big. "I thought (assistant coach) Maggie (Frezzotti) put in a good plan going into our week of practice offensively and we produced this weekend. We put up some big numbers." Montana's four-run third started with Lexi Knauss drawing a walk and Sellers singling off the glove of Portland State first baseman Kaela Morrow. Maddy Stensby then reached when her chopper was misplayed by Parrish. Maygen McGrath and Katie Pippel followed with RBI singles. Then Kylie Becker's ground ball resulted in two more runs when Portland State botched a double-play bid. McGrath added an RBI double in the fourth that stretched Montana's lead to 5-3 and it proved to be all the runs the hosts needed. "It think this weekend was really big in boosting our confidence going forward," said Sellers, who boasts team-high 25 RBIs and 21 extra-base hits. "We all know we can come back in a game. We scored nine runs in an inning (Saturday). Who thought? Well we knew, because we are a family. Our big thing is shock the world, little Montana." Bill Speltz is the Deputy Sports Editor of the Missoulian. Email him at bill.speltz@missolian.com or bill.speltz@406mtsports.com.